So Dave ran Marlin, Sam, and I through an introductory Lone Wolf Multiplayer adventure last Monday. I think a good time was had by all. Dave narrated a rather bizarre tale that centered around cheese and mobile mushrooms. Dave did a.... very believable "impression" of a crazy person. We played the rules "as written" and I just simply find the combat resolution system to be ineffective and actually not a whole lot of fun. Where's the fun when the enemies never independently attack you? Kinda a weird system. Still, it's a LOT better than DnD4.Essentials. Essentials should have been more like LWM and a lot less like 4.0 DnD. Anyway, I'm looking forward to another gaming session next month. Remember - the 4th Monday of each month at Comic Store West, Dave's going to be running Lone Wolf Mulitplayer - all are welcome! 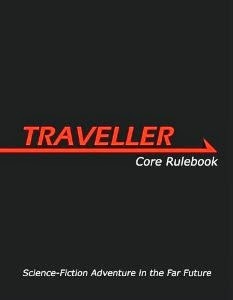 Fun if you're an old fan or just looking for a quick, easy rules-lite fantasy RPG! I think every fanboy has... *ahem* fond memories of Lynda Carter's classic Wonder Woman. So much time has gone by since the original Wonder Woman show was aired that the original costume has entrenched itself in our collective geek consciousness. So when the studio released the first pictures of Adrianne Palacki in the new Wonder Woman costume for the upcoming Adventures of Wonder Woman, it was sure to cause a fuss. Fans are split on what to think. I, myself, think it looks a little to plastic-y and manufactured. A little too, "Hollywood." I actually like some of the pics floating around on the web showing a more gritty, realistic Wonder Woman outfit such as the one below next to Palacki. But lighthearted or serious, I just hope the studio invests the same energy they put into Smallville. Starting this upcoming Monday, the forth Monday of each month you will be able to be mystically whisked away to Magnamund, the world in which the Lone Wolf solo adventure books and RPG is set. This event is called Magnamundays! Dave Kot, friend of KGS, will be running Lone Wolf Multiplayer for anyone who wishes to play! So grab a D10 and head to Comic Store West to check out this simple gaming system set in the complex world of Magnamund! FOR SUMMERLUND! I love the Scream movies. Yes, I unashamedly own the collectors boxed set of the original three movies. When I heard they were making a Scream 4, I was a little perplexed because clearly the original three movies were sold as a trilogy. Despite the fact that this irked me, I was also excited because my theory that I've held since the first Scream has yet to be proven: That Sydney's father is actually behind all of the murders. So I guess we're left with a "trilogy" like the Hitchhiker's Guide - with more than three installments in the trilogy. But what's left to do with the Scream franchise? They've already twisted the genre in on itself, metacognitively self-analyzing every convention of the horror genre. As it turns out, the Scream franchise still has quite a bit to say that it hasn't said already. WARNING: SPOILERS BELOW!!!! DO NOT READ IF YOU DON'T WANT TO LEARN CRITICAL INFORMATION THAT RUINS SURPRISES ABOUT THE MOVIE! The cast is an all-start bonanza. You're recognize almost every character in this movie from the girls who die in the opener to the cops that are destined to die to the plethora of high-school misfits that populate this film. You can tell that the Hollywood talent really lines up to work with Wes Craven. The timeline has accelerated around 10 years from the original trilogy so characters have moved forward as well. Sydney is an author on a book tour who returns to Woodsboro. Dewey and Gale are married, Gale a retired reporter with struggles to write novels because of writer's block, Dewey is now the town Sheriff. There are probably a good dozen or so other characters thrown in as well and it's a good thing because the body count really stacks up. Scream 4 really makes good advantage of advances in technology. You see characters using iPhones, laptops, and webcams in new and unique ways that just simply didn't exist when the other Scream movies were made. In this one, the murders are actually making a movie as they kill by using webcams to record everything. Who knew there was an iPhone app that made your voice sound like Ghostface's? A lot of horror movies have come and gone between Scream 3 and 4. In Scream 4 the characters probably discuss or mention close to 50 other horror movies. Changes in the genre are analyzed in typical Scream fashion and then reflected on as the killers patterns their killings on these new genre trends. Scream 4 really kept me guessing as to the identities of the killers. The red herrings are so strong that you actually have difficulty seeing the killers hiding right in plain sight. Also, as my wife can attest, it made me jump probably about ten times. Which is awesome because you KNOW its coming. Craven is a master! A long time ago I first learned about Jack Vance's Dying Earth stories in Appendix N of the AD&D Dungeon Master's Guide. The D&D magic system, where magic users could memorize only a specific number of spells, was taken directly from this series, as were many of the spell names (prismatic spray, anyone?). I've read all four novels several times, and thoroughly enjoyed Vance's strange, richly detailed world and the very fallible people living in it. All four novels are now available in a single volume, Tales of the Dying Earth, and if you haven't had a chance to read these, please do so. 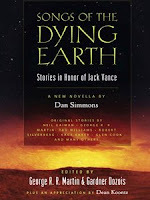 Vance, a prolific writer in several genres, hasn't written any new Dying Earth stories in a long time. Lucky for us, other writers have stepped into Vance's world of powerful sorcerers, odd creatures, demons, and antiheros living through Earth's last days before the red sun finally goes out. 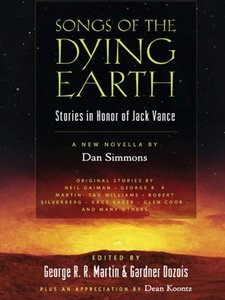 Their stories are collected in Songs of the Dying Earth, and what a rich collection it is! Filled with 22 short stories by such great writers as George R.R. Martin, Robert Silverberg, Kage Baker, Neil Gaiman, Tanith Lee, Glen Cook, and Mike Resnick, and also including the novella, "The Guiding Nose of Ulfant Banderoz," by Dan Simmons, this collection will satisfy even the biggest Vance fan. 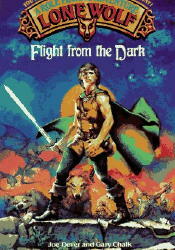 I've read through about half of the stories so far, and haven't found a bad one yet, which is a tribute not only to the writers and editors, but to Vance's world, which seems to bring out the best in fantasy writers. I highly recommend both Vance's work and this collection to any fantasy reader, but especially to RPGers and game masters, as there are some fantastic ideas and constructs within these pages that can be added to your game. 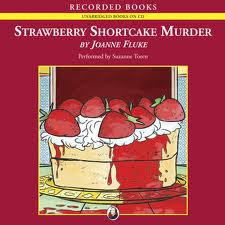 Okay, so in case you didn't figure it out, Strawberry Shortcake really isn't going to be murdered in an upcoming special. That character has been dead for years. No, seriously - it was an April Fool's Day joke, Please don't sue us, American Greetings. Likewise, shockingly, there is not Pass the Pigs RPG. But there should be. Seriously. I would go hog wild for something like that. It appears Strawberry Shortcake will meet her baker. In what I regard as a cheap sales ploy in response to sagging sales, American Greetings toy and licensing division has announced an upcoming special in which Strawberry Shortcake will be murdered. Haven't we had enough of these "murders?" We all know that Strawberry Shortcake will be knocked off only to be revived six months later just like Captain America and Superman. After all she will star in the upcoming 2012 movie, Strawberry Shortcake: Served Cold. The title really gives it away for me. As a big fan of Strawberry Shortcake, this kind of cheap sales gimmick really reveals how little respect American Greetings has for the character. The only question I have is who will do the deed? Could it be that Raspberry Tart finally shows her true colors? Plum Puddin' is a prime candidate in my book - he/she has always been a little suspect after he/she first showed up as a dude and then without explanation became a female. Orange Blossom is another likely suspect - she came from the Big Apple and we all know about the state of morality in big cities. Certainly nobody would suspect Angel Cake, but doesn't that make her the perfect suspect? Or, perhaps, the Purple Pie Man is finally able to give Strawberry Shortcake her just desserts. American Greetings, you should be ashamed of yourself for stooping so low. Strawberry Shortcake and her legion of fans deserve better. If you feel like being depressed, check it out at http://www.indiebound.org/book/9780763648770. For nearly thirty five years, the "dice" game Pass the Pigs has thrilled and amused the young and old alike. It was quite a hit at the recent Keystone Gaming Society / Girl Scout gaming day. Over the years, this game has been produced by various manufacturers and several gaming in this same system have been released including Snout! (a card game), digital Pass the Pigs (available online or as an app), and Deluxe Pass the Pigs. "The overwhelming success of Pass the Pigs across decades has prompted us to extend our product line for this property in a bold, new direction: Role Playing, both tabletop and live action. Pigs have always had a place in the hearts of Americans from the Three Little Pigs to Miss Piggy. Who wouldn't want to role play a pig? The initially offered gaming world will be set in the modern world with players rolling up a pig or hog character. I believe this game's big innovation is that players won't use standard dice but the core mechanic will instead use the unique Pass the Pigs pig dice. What adventure awaits in the barnyard and even beyond? Look for our initial offering in the spring of 2012." 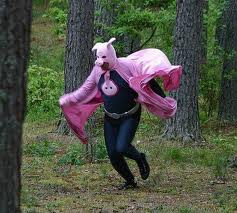 Below is a picture of a play tester in Pass the Pigs: The LARP.